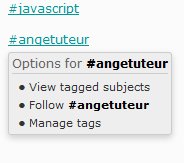 This modification provides extended options for interacting with hashtags, allowing you to quickly follow tags, view tagged subjects, and manage your tags. Create a new new script with the following settings. Now we just need to add some CSS so the popup is displayed correctly. Go to Administration Panel > Display > Colors > CSS stylesheet, and paste the following style rules. The script additionally adds a classname to all hashtags in posts, so if you want to add a unique style to hashtags, you can use the following rules. The default result is this, but you're free to change the style. This modification will add an additional button to your editor. The button will allow you to type out your hashtag name, or choose from a predefined list of the tags you're currently following. Attention : Invalid characters will be replaced by _ on insertion. So the button has an icon and the drop down, it's necessary that you add some CSS to your stylesheet. Go to Administration Panel > Display > Colors > CSS stylesheet, and paste the following style rules. Click submit, and you're ready to do some tagging !.. hash tagging !